The Chicago Symphony Orchestra musicians remain on the picket line, striking since March 10 mainly over pensions. “The core difference between our plan and their proposal is that our plan keeps the guaranteed retirement benefit funded by the Association that has been the hallmark of the Orchestra’s benefit package (and those of other leading orchestras) for over 50 years,” said Cynthia Yeh, CSO percussionist and member of the negotiating committee, as reported by the Chicago Tribune. "The CSO board members are acting like they're running a business," Yeh said. "The CSO is a not-for-profit." The chair of the CSO board is Helen Zell, wife of Tribune owner and billionaire Sam Zell. CSO music director Riccardo Muti issued a statement prior to the strike, saying, “As music director and a musician of this orchestra, I am with the musicians." The musicians are performing free concerts in Chicago, including one at the Chicago Teachers Union headquarters on Monday, March 25, which has been filled by those already registered. Tonight they're playing at Roosevelt University’s Ganz Hall, 430 S. Michigan Ave., at 8 p.m. The concert will feature a chamber orchestra playing selections from Beethoven, Schubert and Mozart. For tickets, go to https://tinyurl.com/CSOganzhall. Wealthy CSO board treasurer James Mabie co-founded ChiArts high school—and both outfits refuse to fund workers’ pensions. CHICAGO—Finance executives have salivated for decades at the prospect of getting their hands on workers’ retirement nest eggs and the high fees they can generate for financial service firms through vehicles like 401k plans. Workers, on the other hand, have fought hard to hold onto their pensions, which are protected from market risk and safeguard retirees for as long as they live. That struggle is playing out today as Chicago Symphony Orchestra musicians strike to preserve their pensions. Management has dug in its heels—including investment executive James Mabie, who serves as the CSO board’s treasurer and has made millions in his own right in investment banking and financial services. Mabie’s hostility to pensions for workers doesn’t stop at the CSO, though. For a decade, the unionized charter high school he cofounded—ChiArts, the Chicago High School for the Arts—has refused to pay into the pension fund for educators who serve Chicago’s public school students. CTU President Jesse Sharkey will join striking CSO musicians at 10AM TODAY, Thursday, March 21 in front of Orchestra Hall, at 220 S. Michigan, to connect the dots, defend workers’ pension rights and decry the greed that threatens the retirement security of both theworld-classd class musicians and ChiArts’ hardworking teachers. 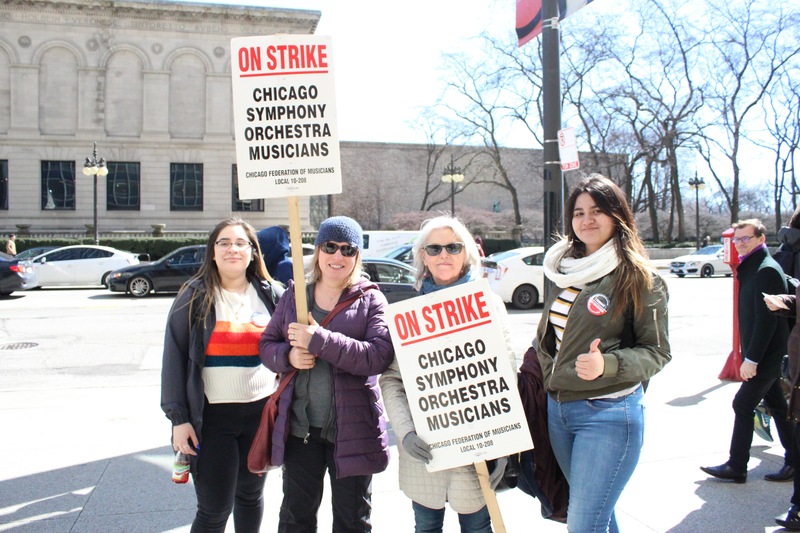 “Every worker deserves a retirement with dignity—and we will fight tooth and nail collectively to ensure that this right is not denied, either for the musicians of the CSO or our teachers at ChiArts,” said Sharkey. Mabie made millions as a partner for over 30 years at William Blair, which has more than $60 billion in assets under management, until he struck out last year to form his own company, Chicago Capital. His income gave him the means to position himself as one of Chicago’s leading arts philanthropists. But his largess seems to stop when it comes to securing the retirement security of the very workers who are the backbone of the arts groups that give him stature, from the CSO to ChiArts, where he serves as founding board chair. The CTU has been bargaining for months with ChiArts management, which finally agreed late last year to begin paying into the CTPF, the pension fund for teachers and paraprofessionals whose salaries are funded by CPS. But ChiArts management quickly reneged on the agreement, instead arguing that because the school formed not as a charter but as a ‘contract’ school to duck charters’ open enrollment requirements, it didn’t have to pay into the CTPF. That claim, which the CTPF disputes, is a key point of contention at the bargaining table—and could push ChiArts teachers to strike. Mabie and his wealthy cohorts have been no less hostile to CSO musicians’ pensions, even though management has admitted that it would likely be cheaper to preserve the current pension plan rather than force musicians into a 401k plan. Investment executives like Mabie earn an enormous amount of money handling other people’s money, while workers forced out of defined benefit plans—their pensions—and into so-called defined contribution plans like 401k’s bear all the risk of those firms’ actions. Perils can range from outrageous fees to irresponsible investment strategies. The payoff for investment players like Mabie, though, can be enormous—and it can be argued that management’s assault on the CSO musicians’ pensions by Mabie and his fellow board members represents the worst kind of self-dealing. Investment executives like Mabie make their money not just by playing in the stock market, an enormously risky bet for workers’ retirements, but by charging fees for the privilege of gambling workers’ dollars in the markets—which can significantly erode workers’ retirement nest eggs. Fees alone for 401k plans, which Demos policy analysts have decribed as fatally flawed, can undercut the value of a worker’s retirement accounts by as much as 30%. The defined contributions racket also denies workers of any agency, unlike pension funds, which elect their officers and are accountable to their contributors. CSO musicians are having none of it—and CTU members are supporting their struggle to preserve the pension rights that have made the CSO a top destination for the world’s best musicians, just as pension rights protect the teachers who are educating our next generation. On Monday, April 1st at 7:30pm the entire CSO will perform at the Benito Juarez Performing Arts Center (1450 West Cermak Road, Chicago, IL). Free tickets are available at: http://tinyurl.com/CSOBenitoJuarez. The concert features Beethoven’s Overture to Egmont, Op. 84 and Symphony No. 7 in A Major, Op. 92, as well as Mozart’s Clarinet Concerto in A Major, K. 622, featuring Stephen Williamson on clarinet with Jay Friedman as Guest Conductor. On Wednesday, April 3 at 7:30pm the Musicians present a chamber music concert at Lutkin Hall, Northwestern University (700 University Place, Evanston, IL). Free tickets are available at https://tinyurl.com/CSONorthwestern. The CSO’s Yuan-Qing Yu (violin), Blair Milton (violin), Wei-Ting Kuo (viola), Kenneth Olsen (cello), and J. Lawrie Bloom (clarinet) will play Leclair’s Sonata No. 3 for Two Violins, Op. 6, in C Major, Beethoven’s String Trio, Op. 6, No. 1 in G Major, and Weber’s Quintet for Clarinet and String Quartet in B Flat Major, Op. 34. The Musicians of the CSO are on strike to ensure that the orchestra whose benefit package has fallen behind those of other cities is strengthened to ensure the well-being of Orchestra members and the future of the Orchestra itself. Additional information about these and upcoming free concerts and news of the Musicians’ strike are available atChicagoSymphonyMusicians.com, https://www.facebook.com/csomusicians, and https://twitter.com/MusiciansChiSym. a ticket is needed to attend, the tickets are free, I have attended 2 free concerts and they are wonderful, They are in the evening and during the day. The musicians appreciate those who attend.